The FIE Compression Testing Machine incorporates design features to enable high accuracy testing with economy, speed and versatility. Panel & PC graph enables to study the behavior of the material. Motor driving geared shaft for quick and effortless adjustment of cross-head to facilitate rapid fixing of the test specimen. Simplicity in reading because of Digital Read-outs. RS-232 serial port to transfer data to computer for analyasis. Operation of the machine is by hydraulic transmission of load from the test specimen to separately house load indicator. The system is ideal since it replaces transmission of load through levers and knife edges, which are prone to wear and damage due to shock on rupture of test pieces. Load is applied by a hydrostatically lubricated ram. Main cylinder pressure is transmitted to the pressure transducer house in the control panel. The transducer gives the signal to the electronic display unit, corresponding to the load exetted by the main ram. Simulteniously the digital electronic fitted on the straining unit gives the mechanical displacement to the electronic display unit. Both the signals are processed by the microprocessor and load displacement on digital readouts simulteniously. It consists of a hydraulic cylinder and a table coupled with the ram of hydraulic cylinder, mounted on robust base. The cylinder and the ram are individually lapped to eliminate friction. 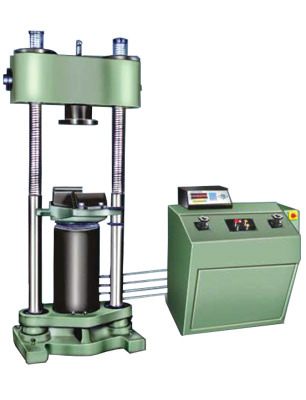 The cross-head is connected to two screwed columns and is driven by a motor, for rapid adjustment of test height. 7 segment display to show laod and compression. Data entery of test parameters including rupture % peak, pre-load, module data, test data & specimen data etc. through numeric key board. The universal 2001-UTE Series control panel can be hooked to any PC using RS-232 communication port. FIE offers different exhaustive application. Window based software package with real time graphon PC to enable that user to effectively evaluated different parameters. Standard Deviation (Other statistical parameters on request). Selectable batch statistical printouts. All FIE Electronic Universal Testing Machines are closely controlled for sensitivity, accuracy and calibration during every stage of manufacture. Every machine is then calibrated over each of its measuring ranges in accordance with the procedure laid down in BS : 1610 and IS : 1828 : Part 1 : 1992 , Electronic Universal Testing machine comply with the grade "A" of BS : 1610 part 1 : 1992 and lass 1 of IS-1828-Part-1 : 1992 an accuracy of + 1% is guranted from 2% to 100% of the capacity of machine below 20% of the selected range, maximun permissible error is 0.2% of the full load range. These include load stabilizer, Brinell test attachment, Bend Test attachment and a wide range of accessories offered on request at additional cost.